A lot has changed in climbing over the years, especially the questions. My climbing career has covered almost 35 years and my elbows have the tendonitis to prove it. Back in the day, as we now say, there were no climbing gyms. Instead, we climbed on the sandstone walls at Stanford with the likes of Jim Collins. We put up first ascents on the California Central Coast in places like San Luis Obispo and Cambria. We traveled to Yosemite, Tuolumne Meadows, Tahoe and the High Sierra to climb the Great Moderates, experience Big Wall Epics, drink wine and tell stories around campfires. 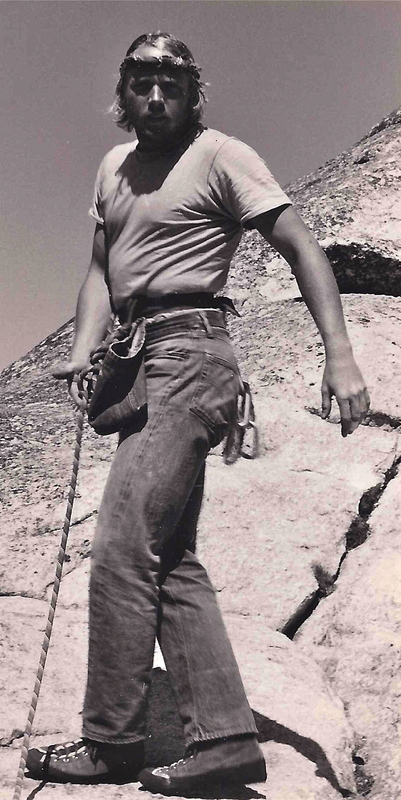 We read stories about Reinhold Messner and aspired to one day climb great faces in far off places by climbing the Alpine Routes in the Sierra and Cascades. Back in the day, Owens River Gorge was new. The Peabody boulders were simply training tools during bad weather. Sport climbing was neither and the domain of the French. Bouldering was what you did to train for climbing long routes. Long Routes were what you climbed to train for doing Big Walls. Big Walls prepared you for the grit and depravity of extended hardship on still bigger climbs. And, in the winter, we took the early generations of ice tools and skied into the frozen wastes of California to ply Frozen Falls. All of it was to prepare you for climbing the Great Faces. Not sponsorship. We were Dirtbag Road Denizens with jobs. That was climbing. This blog is not about harkening back to the old days or complaining. It’s about reveling in the metaphor of climbing. It’s about how our everyday lives continue to happen, plans still get made and dreams are still pursued to the point of being turned into goals that are either accomplished, traded for other things, or resulting in failure. More importantly, I’d like to talk about the humor and lessons learned from that pursuit. I now live in Boulder, Colorado, but grew up in Northern California where I put over 60,000 miles on my car in one year because of my commuting to Tahoe, Yosemite and points beyond. Happily working in hi-tech marketing for over 30 years, I have a pretty good insight on some of the most successful companies and their leaders – Oracle and Larry Ellison; Apple and the late, great, Steve Jobs; HP and the late John Young; Intuit and Scott Cook; and, many others. Now, though, I live in the mountains above Boulder with my wife Dianne, my Goldens Wilson and Bridger, and our cat Jeffurson. Dianne and I met while I was traveling the world rolling out an online learning platform for Oracle, and we now run our own PR and Marketing agency, Enfuego Strategic Communications. And there you have it. From Dirtbag Road Denizen to modern-day inspiration for everyone from aging Baby Boomers to aspiring Millennials who are still trying to figure out how to do things without their parents doing it for them. It’s a crazy world and full of a lot good stories. I knew I wasn’t wasting time around those campfires…I was just honing my mentoring skills.